This episode was written by Dale French and drawn by me, L8on Connor. Since I'm bringing the story of Fuzzball & Scuzzball to a close, it was important to me to invite Dale, the guy who created or co-created most of these characters, to participate. He agreed to write some scripts; this is the first of several. It's been awhile since Dale joined in the fun, but if you go back a few years, you'll see that he wrote the bulk of the Creature the Creature Comes to Town story. 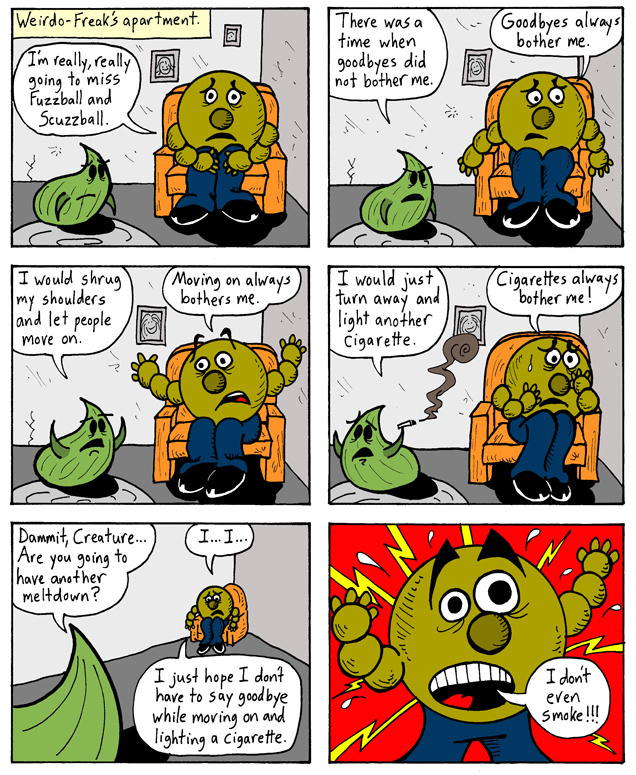 For today's comic, I could have written a conversation between Weirdo-Freak and Creature, but I wouldn't have gotten Creature's weird anxiety quite right. Creature is a character close to Dale's heart, and I'm glad Dale stepped in to bring him to life again.